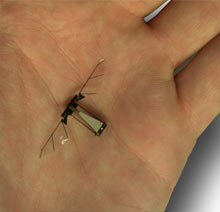 Researchers at Harvard have developed a robot that flies like a..fly. Using laser micro-machining techniques developed in house, and DARPA funding, the robo-fly was constructed from carbon fiber and polymer. This iteration is 60 mg with a wingspan of 3 cm and flies with a tether and external power - future versions are likely to be smaller, independent, and even more bug-like. This technology will be ideal for gathering information from targets on the move, or where access might be difficult i.e. trying to plant a traditional listening device. Once development costs come down and the technology improves, as it certainly will, one can imagine clouds of these things being released over hostile territory to engage in mobile, nearly invisible, real-time intelligence gathering. Pretty difficult, in an Afghan cave for instance, to discern the DoD fly from its biological comrades. They could be used to guide precision bombing as well, confirming targets on the fly, as it were. By fitting many little carbon-polymer pieces together, the researchers are able to create rather complicated parts that can bend and rotate precisely as required. To make parts that will move in response to electrical signals, the researchers incorporate electroactive polymers, which change shape when exposed to voltage. The entire fabrication process will be outlined in a paper appearing in an upcoming edition of the Journal of Mechanical Design. After more than seven years of work studying flight dynamics and improving various parts, Wood's fly finally took off this spring. "When I got the fly to take off, I was literally jumping up and down in the lab," he says. ...Tiny, lightweight sensors need to be integrated as well. Chemical sensors could be used, for example, to detect toxic substances in hazardous areas so that people can go into the area with the appropriate safety gear. Wood and his colleagues will also need to develop software routines for the fly so that it will be able to avoid obstacles.